With ambitious housing targets and concern over the loss of countryside, there is a strong case for considering higher density housing development in Kent and Medway. However, previous poor practice has led to suspicion of ‘non-traditional’ development by many. In this study tour we aim to challenge these views and focus on the opportunities building at higher density can bring to repair and improve urban environments. We will examine how higher density development can not only deliver successful places to live, but also create active mixed use communities and public spaces. Setting off from Stratford International at 9.30am, we will begin the tour with the highest density schemes including the St Andrews development in Bow, before gradually working our way towards Barking. Developments we will visit along the way include Trinity Buoy Wharf – considering how to create a viable mixed use community in an area of intense housing development, and Barking Town Centre – understanding how well integrated development and public realm design can help define a civic centre. 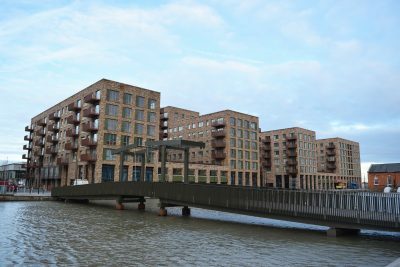 The tour will end at the Barking riverside development, before returning to Stratford International at 4.30pm. There will be contributions from a mix of architects and developers involved in some of these schemes throughout the day.